Reducing child mortality is a high priority in sub-Saharan Africa, and swift, appropriate triage can make an important contribution to this goal. There has been a lot of interest and work in the field of triage of sick children in South Africa over the past few years. Despite this, in many parts of South Africa no formal system for triage of children in acute and emergency settings is used. This article aims to explain some of the key paediatric triage tools being considered and developed in South Africa. The triage tools discussed are the World Health Organization Emergency Triage Assessment and Treatment (ETAT), the South African adaptation of this tool known as ETAT-SA, the South African Triage Scale (SATS), and the Revised Paediatric SATS (P-SATS). The article describes how they were developed and their relevance to the country. 'In the five minutes taken to read this page 70 children will die.' So opens the World Health Organization (WHO)'s Countdown to 2015, the 2012 Report. We know that early identification and prioritisation of sick children (triage) in health facilities can reduce child mortality. There has been a lot of interest and work in the field of triage of sick children in South Africa (SA) over the past few years. Despite this, many parts of SA use no formal system for triage of children in acute and emergency settings. This article aims to explain some of the key triage tools being considered and developed in SA, how they evolved and their relevance to the country. The word 'triage' comes from the French verb trier, meaning to pick or sort. It first appeared in the English language in the 18th century to describe the grading of sheep fleeces. Napoleon's surgeon-in-chief introduced the practice of assigning acuity levels to military casualties in the early 19th century, but the word 'triage' to describe this practice only came into medical usage in the 1930s. Emergency triage is a process of rapidly sorting patients into groups based on the urgency of their condition. There are many different triage systems around the world. Most commonly, triage is based on some combination of presenting complaint, clinical discriminators, factors from the history and/or physiological variables (such as vital signs). The case management component of the WHO Integrated Management of Childhood Illness (IMCI) is an algorithmic approach for health workers in developing countries that has proven benefits for the care of sick children. It has been adopted for primary healthcare (PHC) settings in SA since 1997. While containing assessment tools that should enable the practitioner to identify the sickest children, it has only a rudimentary triage element. Children are seen in order of arrival with no formal rapid evaluation of new waiting patients to identify any who may be sicker. Once the child reaches the front of the queue, an initial check for 'general danger signs' is done (a form of triage), but even in their presence the clinician is instructed to 'complete the assessment' before initiating therapy, unless the child is lethargic or unconscious. Further assessment is based on symptoms rather than acuity. A study evaluating the quality of IMCI assessments in SA found that only 12% of health workers checked every child for danger signs, and only 52 (46.4%) of 112 children assessed as having a danger sign or a severe classification by the IMCI expert were also classified as severe by the health worker. While very valuable as a clinical tool in PHC settings, IMCI therefore contains an incomplete and potentially delayed rapid evaluation for common life-threatening problems. It is estimated that about 10 - 20% of children presenting to PHC will need to be referred to the next level hospital - and these are likely to be the sickest children. In recognition of the fact that emergency care for children at referral hospitals in the developing world is often sub-standard, the WHO developed the Emergency Triage Assessment and Treatment (ETAT) guidelines in Malawi. The ETAT guidelines are specifically intended for use at hospital level and form chapter 1 of the WHO Pocket Book of Hospital Care for Children. The ETAT guidelines can be divided into three main sections: an emergency triage (ET) system, a section on assessment and treatment (AT) of common paediatric emergencies, and a section on implementation of ETAT. We will focus primarily on the ET section. The ET system of ETAT has three triage categories: emergency, priority and queue. Triage starts with a rapid clinical evaluation for any emergency signs using the airway-breathing-circulation-coma-convulsions-dehydration (ABCCCD) approach. Any child with emergency signs is taken immediately to the resuscitation room for further assessment and treatment. If there are no emergency signs, the triage nurse checks for priority signs, which are summarised in the mnemonic '3TPRMOB' (Fig. 1). If any of these signs are present, the child is brought to the front of the queue. If no emergency or priority signs are found, the child is labelled a 'queue' (non-urgent) patient and must wait in line to see the clinician. The generic WHO ETAT course has seven modules and is run either as a 31/2-day course or as separate modules. The ETAT guidelines were field-tested in several countries including Angola, Brazil, Cambodia, Indonesia, Kenya and Niger, and have subsequently been rolled out in many low-income countries. In 2009, when the National Department of Heath wished to pilot the ETAT guidelines in SA, a group was formed to convene a course. However, it became clear that the 'assessment and treatment' (AT) part of the generic ETAT guidelines was too elementary at hospital level in the SA setting. Consequently, a team of SA child health experts including two of the authors (BC and CS) undertook the process of adapting the ETAT manual and training materials for use in SA. The resulting version of ETAT is called 'ETAT-SA' and is available from Cindy.Stephen@kznhealth.gov.za. Only minor changes were made to the 'emergency triage' (ET) system, including the option of checking oxygen saturation if a monitor is available (emergency if <92%), defining a 'tiny infant' as less than 3 months of age, and checking the temperature in any child who felt hot (fever defined as >38ºC). 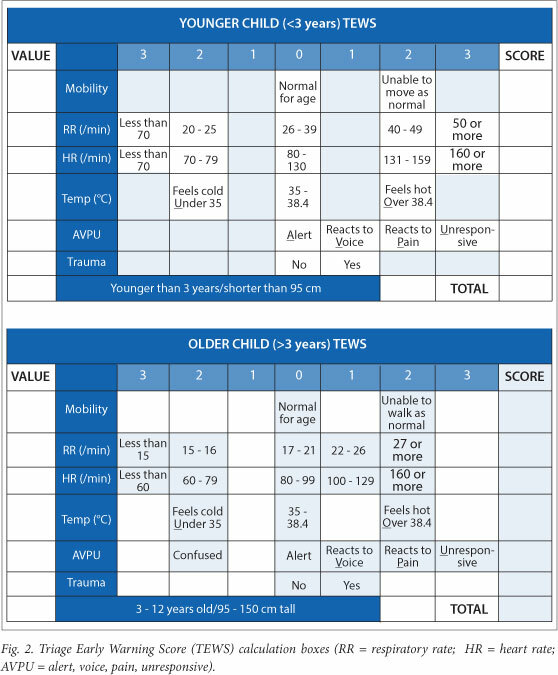 The South African Triage Scale (SATS), originally known as the Cape Triage Score, was developed in 2004 and revised in 2009 by the South African Triage Group, convened under the auspices of the Division of Emergency Medicine at the University of Cape Town and Stellenbosch University. [10,11] SATS is a four-category colour-coded triage system: emergency (red), very urgent (orange), urgent (yellow) and non-urgent (green). 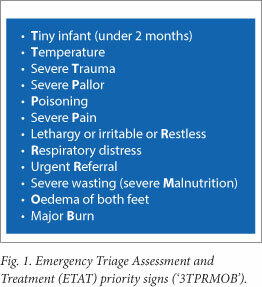 Triage in the SATS system is based on rapid evaluation of clinical discriminators combined with an age-appropriate composite physiological score, known as the Triage Early Warning Score (TEWS). Points are given for normal versus abnormal mobility, respiratory rate, heart rate, temperature and the presence or absence of trauma (Fig. 2). There are two paediatric versions of the TEWS, one for the younger child (less than 3 years) and one for the older child (older than 3 years). If any emergency clinical signs are found at triage, no TEWS calculation is done. The SATS tool has been validated in public and private healthcare settings in SA, as well as in the pre-hospital setting. SATS has been implemented by Médecins Sans Frontiêres into field hospitals around the world and is also being used in Brazil, Sweden, Poland and Ireland. SATS was adopted as the official triage tool of the Western Cape Province (WC) in 2006. All WC Metro Emergency Medical Services pre-hospital providers and all WC emergency centres use SATS. The SATS triage tool is regularly revised every 3 - 5 years. Paediatric colleagues in the WC were concerned that the original paediatric SATS tool was not able to identify life-threatening emergency signs as rapidly as ETAT-SA. There was also a preference for the simple 'common-sense' ETAT-SA approach to clinical signs in children. To address these concerns, the WC Department of Health convened a multidisciplinary Triage Technical Workgroup (TWG) in 2011 to undertake an extensive revision of the paediatric SATS tool. A modified Delphi consensus approach was used to adapt and incorporate the emergency triage (ET) part of ETAT-SA into SATS (M Twomey - personal communication). The resulting tool is known as the Revised Paediatric SATS tool (P-SATS) (all SATS materials available at http://emssa.org.za/sats/). The P-SATS retains the four colour categories of SATS but now starts with the 'ABCCCD' ETAT approach to immediate emergency sign identification. The TWG addressed each ETAT emergency sign, and many of these were revised. Examples include the addition of 'any reported apnoea' to A-B emergency signs, lethargy to shock clinical signs, and 'post-ictal not alert' to convulsion evaluation. Each of the ETAT-SA priority signs ('3TRPMOB') and all the original SATS clinical discriminators were reviewed by the TWG. Eight of the original 12 ETAT-SA priority signs were retained and another 11 signs were added, 6 being trauma related and 5 medical. These 'priority signs' were divided between the very urgent and urgent categories using a consensus approach (http://emssa.org.za/ sats/#chapter3). The step-by-step triage process was better defined and clarified into an easy-to-follow flowchart (http://emssa.org. za/sats/#chapter2). A validation study of the P-SATS, conducted in 2011, included 2 014 children aged less than 13 years who were triaged at six sites in the WC. This study showed that the tool is safe and valid with a sensitivity of 91% and a negative predictive value of 95% for admission to hospital. It also showed that neither clinical parameters nor vital signs alone are adequate to detect the sickest children reliably at triage. Of the 434 admissions in that study, clinical signs alone failed to identify 32%, while TEWS missed 13%. This finding is in keeping with 'early warning score' literature which suggests that taking note of abnormal vital signs allows earlier identification of sick children. [14,15] It therefore seems prudent to maintain measurement of vital signs and calculation of a TEWS as part of the triage process wherever possible. One of the authors (BC) has further combined the P-SATS with the AT' component of ETAT-SA to form the 'Paediatric South African Triage Scale Assessment and Treatment' (P-SATSAT) training course. The course has six modules (as there is no implementation module), and it is run over 2 days. Unlike the ETAT and ETAT-SA courses, the P-SATSAT is a pass-fail course. Testing consists of a multiple-choice question paper, a short-answer question paper and four objective structured clinical examinations (OSCEs). The OSCE stations test participants' practical skills in: (i) triage; (ii) making 10% dextrose; (iii) drawing up and administering the correct fluid bolus for shock; and (iv) selecting and administering the correct dose of an appropriate anticonvulsant by the correct route. Each section must be passed with a 75% pass mark. Of the 26 student nurses on a pilot course, 24 (92%) passed. Triage must be applied in all first-care settings in SA. Within the setting of emergency centres, the P-SATS and P-SATSAT are recommended for this function. Where large numbers of sick children are seen with very limited staff, the triage component of ETAT-SA provides a good starting point. In IMCI or single-practice settings, a partial form of triage could be implemented by employing one of the following methods. Each time the IMCI or single practitioner is ready to see the next child, all new arrivals in the queue are rapidly assessed for general danger signs. This would require no additional training and would help with earlier identification of sicker children. Alternatively, all IMCI and PHC nurses could be trained in rapid identification of life-threatening signs using a ready-made simple process such as the ABCCCD' approach of ETAT-SA or the 'emergency signs' of P-SATS. Wherever children attend for PHC or emergency care in SA, a form of triage should be used to ensure that the sickest children receive treatment as quickly as possible. We have presented systems that could and should be implemented across the country's health systems, private and public. One of the formal systems should be incorporated into the package of care envisaged for children under the nascent National Health Insurance plan. Conflict of interest. BC is a member of the 'Emergency Triage Assessment and Treatment-South Africa' (ETAT-SA) working group which has adapted the WHO generic ETAT guidelines for the SA health setting. She was also a member of the Triage Provincial Technical Workgroup, convened under the auspices of the Western Cape Department of Health, to incorporate ETAT-SA into the South African Triage Scale (SATS) in 2011. TW was a member of the Triage Provincial Technical Workgroup, convened under the auspices of the Western Cape Department of Health, to incorporate ETAT-SA into the South African Triage Scale (SATS) in 2011. CS is a member of the ETAT-SA working group which has adapted the WHO generic ETAT guidelines for the SA health setting.